What to Expect at the Closing of a Home Purchase | DeLoach, Hofstra & Cavonis, P.A. Many new homeowners look forward to their closing dates as the end of a long and exhausting home buying process. 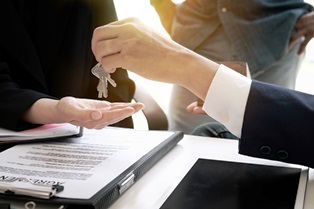 However, closing is often a process in itself, requiring the signing of many documents, money changing hands, and making agreements with sellers and lenders. In addition, a lot of the information buyers need to complete the transaction comes days or hours before the closing meeting, making the period leading up to closing more stressful. Buyers can take some of the pressure off by knowing what to do, what to bring, and what to expect on the date of their closings. A closing is the settlement of all outstanding business between the parties involved in a real estate transaction. It typically involves a buyer, a seller, and the lender who has agreed to finance the purchase. If the new owner is buying the home with cash, no lender will be involved in the closing. A closing allows all of the parties involved to meet at the same time to resolve any outstanding business before the transaction is complete. If a mortgage lender is required, the loan will close at the same time as the home purchase. Once your lender agrees to release the funds, payment is transferred to the seller. The seller then gives you the deed and title to the property, and you'll receive the keys to your new home. Buyers can help ensure a smooth closing by getting to the closing early, remaining engaged throughout the process, and being thoroughly prepared. They can also avoid last-minute surprises by having everything in order before they arrive at the settlement meeting. Know where to go. Settlements often occur in the office of the settlement agent, such as the bank securing the loan or the title company. In some cases, a settlement agreement may take place at a real estate attorney’s office—either the buyer’s or seller’s attorney. Make sure you have the address your closing location as well as the date and time. Make last-minute calls. Buyers should complete a final walk-through inspection of the property 24 hours before closing to make sure everything is in the condition agreed to between the buyer and seller. You must call your real estate agent to schedule the walk-through, and need to inform the seller’s agent if there are any outstanding defects. Also contact your mortgage broker to see if there's anything you need to do before closing to meet the conditions of your loan. Collect documents and funds. There are a variety of documents required for closing, including a good faith estimate of the property; a copy of the home inspection report; and your proof of homeowners insurance. It’s a good idea to bring all documents you've received throughout the home buying process to closing, as well as the necessary funds to complete the transaction in a form that will be accepted, such as a cashier’s check. Confirm when you can take possession. In many cases, buyers will be able to take possession of the property immediately after closing. However, there could be post-closing complications, such as outstanding repairs, that delay your ability to move in. Your real estate attorney or buyer’s agent should be able to tell you when you can take possession of the home. Clear your schedule. It's vital to allow plenty of time to complete your closing, since rushing through the process may cause you to overlook an important detail. Buyers are often advised to take the whole day off work and to be prepared to be at the closing for several hours. One of the many benefits of having an attorney by your side is to ensure your closing day goes according to plan. Our real estate attorneys have over 30 years of experience representing buyers and sellers through a variety of transactions and disputes. Simply fill out the quick contact form on this page to set up a consultation and get answers your questions.